The next level up in chorus effects after the CE-1 Chorus, the world standard, the Boss CE-300 offers two independent chorus circuits to produce full pitch-deviation effects for a wider, fuller sounding effect in the stereo mode, as well as specific deep chorus effects like a multiplex chorus when used in the monaural mode. In addition to the Rate and Depth controls, the Boss CE-300 Chorus provides a Chorus Level control to select the desired proportion of chorus effects to the direct sound. Also, by using the Chorus Tone control, any type of chorus effect desired is possible-from the popular CE-1 type mild chorus effect to one that’s extremely sharp-sounding. All of this is done with a very high S/N ratio, as the Boss CE-300 incorporates built-in noise reduction circuitry. With unequalled ease-of-use and built to extremely high specifications, the Boss CE-300 delivers recording quality performance in the studio or onstage. 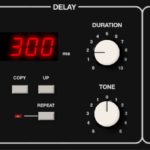 Circuitry features 2 Independent chorus circuits for pitch-deviation chorus effects when the CE-300 is used In the stereo mode with 2 amplifiers. In the mono mode. a full sound like that of a multiplex chorus effect is available. For creating many different sounding chorus effects, the Boss CE-300 comes equipped with four controls. Rate and Depth controls respectively set the rate and depth of modulation. The Chorus Tone control adjusts the sound of the effect while the Chorus Level control allows setting the desired direct/effect sound ratio. A and B outputs are combined at Output jack A to produce a combined chorus effect and direct sound (D+E), while the signal at Output jack B consists of a combined direct sound and inverted effect (D-E). This creates the well known and well used natural chorus effect as well as producing a spacious sound. Output jack A should be used when a monaural effect is desired. Remote effects are foot switch controlled from the remote jack. Input/output jacks are provided on both the front and rear panels for user convenience.